If you see Cyber Security when PC started, then the PC is infected by Cyber Security. It’s quite difficult to remove Cyber Security. 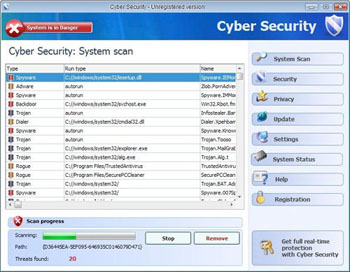 You need a 3rd party program to remove Cyber Security as it will disable your Malwarebytes if you have one. Cyber Security is a rogue antispyware which cant be easily remove unless you make the purchase. However, there are some real anti spyware company is releasing some tools to remove it.